Just like men, women need clubs with the propoer stiffness, weight and length. 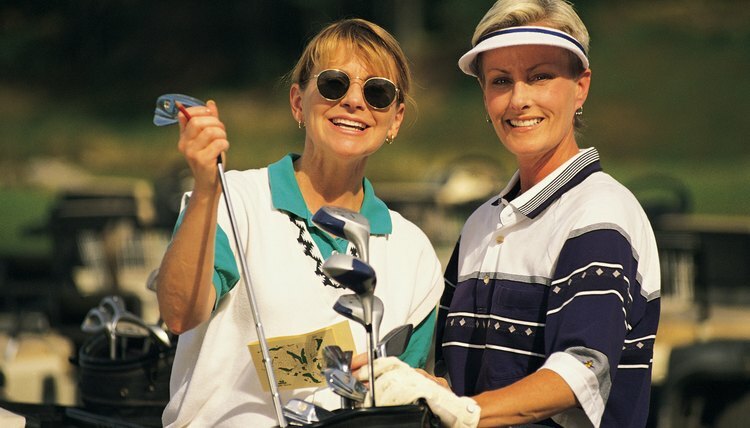 There's an almost endless number of options when choosing the right golf clubs for women. Much of the decision rests with the strengths and weaknesses of her game, and whether she feels comfortable hitting one club versus another. For instance, she may hit a hybrid club more consistently than a long iron. Or she may not have the skills to use a lob wedge, and she therefore opts for a more conventional shot. Choose the correct shafts and stiffness depending on her strength. Shafts are made of graphite or steel and come in five grades of stiffness. Clubs with steel shafts generally are heavier than those made of graphite, and they are easier to hit. Also, if a woman hits the golf ball short, she probably should have clubs with flexible shafts because they will help increase her distance. Make sure the clubs are the proper length. Tall women need more club length than women of smaller stature. Clubs sold in pro shops and sporting goods stores will fit about 85 percent of all golfers. Make sure that grips on the clubs are matched to the woman's hands. If the grips are too large, they will restrict the swing and could result in the face being open at the point of impact. If the grips are too thin, she most likely will become a “hands player” and not complete the proper body turn. Buy the right number of clubs based on her skills. For beginners, five or six clubs probably will suffice. Experienced players have more options but should not exceed the 14 clubs that are allowed in a bag. Determine a budget. Prices vary widely, and price doesn't guarantee the best buy. For example, a $300 set of properly-fitted clubs is a better buy than a set of ill-fitted clubs that cost considerably more.